A social change organization has to communicate clearly, cogently, directly, passionately about the work they are doing so that people will see it, experience it, support it. When it comes to society’s more intractable problems, you cannot look past the role of innovation and creativity to ultimately make a difference when traditional interventions have failed. Jane Golden is the Executive Director of The City of Philadelphia Mural Arts Program. The Communications Network spoke to her about her work and the role of communications in Mural Art’s success. An edited transcript follows. 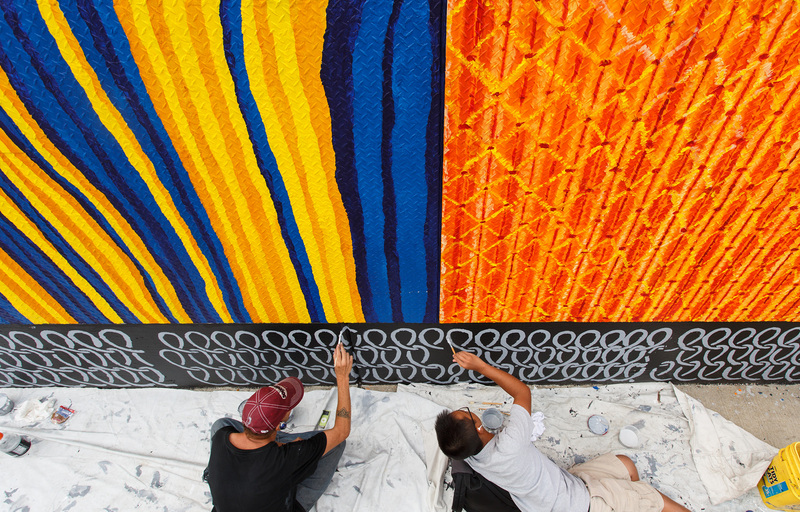 What is The Mural Arts Program and how did it come into being? The Mural Arts Program began in 1984 as a component of the Philadelphia Ant-Graffiti Network a program started by former Mayor Wilson Goode to help reduce graffiti in the city. Between 1984 and 1996 the small art component of this larger organization worked tirelessly to use art as a catalyst for positive social change in communities throughout Philadelphia and offered intensive year-round art programs to young people who had formerly been writing on walls. In 1997 the Anti Graffiti Network was re-structured and the art component formally emerged as The Mural Arts Program. At Mural Arts we believe that art ignites change. We create art with others to transform places, individuals, communities and institutions. Through this work we establish new standards of excellence in the practice of public and contemporary public art. Annually we enroll 3000 people in three major program areas; engage 7000 people in the creation of over 50 major public art projects and host 15,000 on tours of our collection. Our work targets every neighborhood in Philadelphia but we prioritize reaching underserved populations. Our three programs include an art education for youth, a restorative justice program for people in prison and those returning from prison, and a behavioral health-focused program for those struggling with mental illness, trauma and addiction. We also have two other important divisions: a community murals department which focuses on creating projects in collaboration with community groups and organizations and a public art and civic engagement division that produces large-scale artworks meant to push the boundaries of our practice. 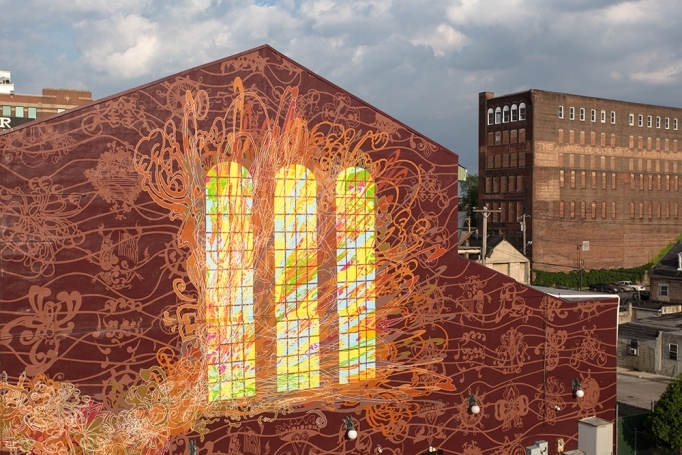 Mural Arts aims to be a change agent – creating dialogue, connection and understanding – can you explain what that means to you? The changes we see impact individuals, communities, systems and by extension there is a great civic impact on our city as we see Philadelphia turn into an outdoor museum that has work embedded in a social process. Every work of art we do involves someone, and by engaging people, connecting them, inspiring them to collaborate, we see how art has a very personal impact. The work we do engages people, stirs something in them, and asks them to talk about their stories, their memories, their struggles, their aspirations. Community based public art represents people in a way that is often new and unfamiliar but extremely important. Mural making, because of its intensive process that is so inclusive, ultimately builds social capital and creates other opportunities for change. As one of our artists recently said, all our work opens “social windows of opportunity” through which we can see things differently and more importantly glimpse other opportunities. What do Philadelphia’s murals say about the city? The murals of this city are autobiographical in nature. They tell us stories of every part of the city and ultimately give people everywhere the dignity and respect they deserve. The fact that our program started in 1984 and today not only has created thousands of new work but also has a waiting list, shows us the great important art has on the life of a city and that there is a demand for art in Philadelphia. This says to me that this is a city that cares deeply about art and all it can do, for young people, for artists who want to work in public, for communities. You yourself are an artist. How do you think about and describe the work of an artist? I think the work of an artist is invaluable. They are the creative thinkers in our society. And I think for all too long art has been marginalized and when one thinks of artists they think of a niche group of outsiders. But this kind of siloing needs to stop. First because the arts are critical to our society, they inspire, they engage, they challenge, they educate and in the end the arts connect us to all that makes us human. But also, when it comes to society’s more intractable problems, we cannot look past the role of innovation and creativity to ultimately make a difference when traditional interventions have failed us. And we understand that artists… the designer, the inventor, the writer, the musician, the teacher… are everywhere and we need them and we need to support them because they make our world a better place. When you hear the word “communications” what does it bring to mind. Why? We have come to see that it is imperative to do great artistic work but in order to sustain the work, in order to continually build a family of friends, supporters and donors, one has to have a strong communications strategy. One has to communicate clearly, cogently, directly, passionately about the work they are doing so that people will see it, experience it, support it. When I hear the word communications I think it is how we tell our story, it is how we build our audience, it is the lifeline of our organization. What’s the role of the arts in effective communication? Does design matter? Why? Design certainly matters. It distinguishes what is seen and what is ignored. It is helps us tell our story in the most profound way or it becomes something seen as white noise. We have learned over the years that the same amount of attention and care we pay to our work, we need to put that same attention to everything generated by Mural Arts, be it our website, our invitations, our annual appeal, the invitation we send out to our major gala. Design matters. What’s the toughest audience that Mural Arts tries to reach? How do you approach them and why? I love it when people say “I hate murals” and then when I probe, it turns out there are murals they actually like. It is a strange conversation because the city is filled with things I like and don’t like. It is after all the 5th largest city in the country and it seems we all benefit from being open minded about what exists here – buildings, sculpture, murals, etc. And art is so subjective. I would never expect someone to like all murals but I don’t expect people to be judgmental. The more diverse, rich and interesting our city is, the better it is for all of us who live here. As people watch a mural being constructed, what should they look for? How do they make meaning of it? One of the wonderful things about murals is that they are generally created in the public’s view. I don’t know if there is a specific thing to look for to make meaning, but muralists tend to be very outgoing people and are usually happy to answer questions to passersby as they are painting or installing a mural. And what better way to learn about the meaning of the mural than by the artist who designed it.